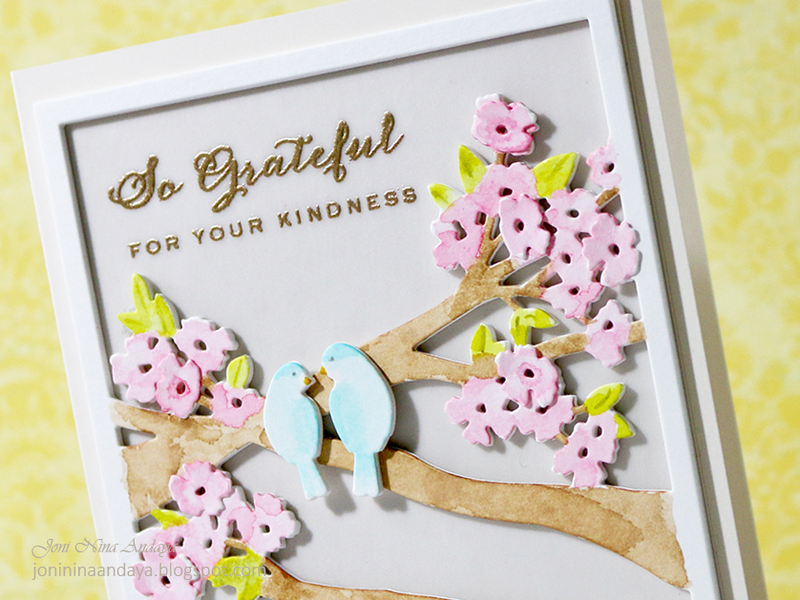 Hello Everyone, I am just sharing this card I made using the Wplus9 Birds & Branches Frame. This is one of my favorite frame from Wplus9. To begin, I started die-cutting the frame from a watercolor cardstock, and watercolored it including the birds. While it dries, I cut more of the frame 3 more times and stacked & glued them all together. Next, I cut a vellum panel same size as the frame panel and stamped the sentiment from Wplus9 Fanciful Feathers stamp set. The sentiment is stamped first with Versamark ink and then heat embossed with gold embossing powder. I then arranged it that the vellum panel is behind the frame and adhered on the card. So gorgeous! LOVING the flowers, the branches and the birds!!!!!!!!! Soft and lovely, hopefully Spring will arrive soon and look like this! This is so beautiful and yet so simple and classy. Just adorable. Your watercoloring simply amazes me, Joni! LOVE this! So serene and elegant and beautiful!